Last month I addressed the fact that although the liver flush tea has been one of my foundational Baseline of Health® formulas for almost 20 years, I had never put together a detailed write-up about it to clarify exactly what's in it, why those ingredients are included, and what the formula does as a whole. Today we do the same thing for its companion product, liver flush tincture. Although these are related formulas and are both used as part of a liver detox protocol and even contain a couple of the same ingredients, they are not the same thing. They play fundamentally different roles in the detox process and are used in very different ways to improve the health of your liver, not to mention your overall natural health. And this is where the liver flush tincture comes into play. Whereas the liver flush tea is primarily a therapeutic cleansing and "easing" formula, the liver flush tincture is essentially a medicinal rebuilding and anti-parasitic formula designed to be used on an as needed basis. Later on we will explore exactly how the formula is used, but for now, let's take a look at its ingredients. Milk thistle, aka St. Mary's thistle, is probably the world's best known liver herb. Its two key compounds are silymarin and silibinin (aka silybin). Dozens of studies have shown that both silymarin and silibinin can prevent or counteract damage to the liver caused by toxins such as alcohol, acetaminophen (Tylenol), and other drugs, as well as environmental (heavy metals) and bacterial toxins, and even poison mushrooms. 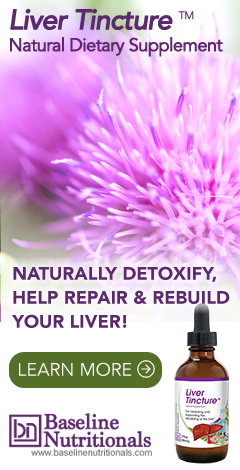 Silymarin combats lipid peroxidation in the liver of rats and has been shown to hasten the restoration of liver cells in damaged liver tissue. Sometimes the mechanism of liver damage is the depletion of glutathione (often from heavy consumption of alcohol). In studies, silymarin and silibinin actually elevated glutathione levels in rats given alcohol. Human subjects with liver damage caused by chronic alcoholism, cirrhosis, hepatitis, or other toxicities were likewise significantly benefited by treatment with silymarin. As a 2003 report in the Journal de Pharmacie de Belgique pointed out, the liver benefitting properties of milk thistle are rather difficult to evaluate objectively.1 Mortality rate in the case of life-threatening liver diseases is the most objective parameter. And as it turns out, silymarin has been tested in living animals deliberately intoxicated with mushroom toxins, medicines, heavy metals, or toxic organic solvents. Preventive as well as curative activity has been confirmed. Silymarin accumulates in the liver, which is also the target organ in therapy. Silymarin even improves the prognosis after accidental ingestion of toxic death cap mushrooms. And silymarin given to patients with liver damage by alcohol lowers the death toll. Side effects are comparable to placebo. Studies have shown that silibinin can block hepatitis C virus (HCV) infection and inhibit T cell proliferation. Even more impressive, a 2012 study has shown that intravenous silibinin inhibits replication of HIV-1.2 As the study concluded, silymarin-derived compounds provide cytoprotection by suppressing virus infection, immune activation, and inflammation, and as such may be relevant for both HIV mono-infected and HIV/HCV co-infected subjects. And milk thistle is quite safe as a supplement. Neither toxicity nor drug interactions have been reported following high doses of milk thistle or its components. The bottom line is that milk thistle has hepatoprotective properties and is safe enough to be used even in cases of chronic liver disease. It is valuable in post-operative liver repair and in the treatment of alcoholic cirrhosis, and, as a bonus, it is cancer protective. But it is only the second most important herb in this formula. Although less well known than milk thistle, I believe that Picrorhiza kurrooa, also known as Kutki, is the single most important liver herb in the alternative practitioner's arsenal. There are certainly some studies to support the contention, but mostly it is based on my over 45 years of observations in alternative health. When I first started using it in liver formulas in the early 90's, it was almost unknown outside of India. Now it has become popular enough to make its way onto the endangered species list--with one important exception. The exception is that it carries an Appendix II listing. That means that although the fresh herb is illegal to import and export, it is perfectly legal to import and export processed extracts of the herb. With that in mind, I use a processed Picrorhiza extract like the picroliv listed in the studies below in my liver tincture formulation. Traditionally, Kutki is a well-known herb in both Indian Ayurvedic medicine and traditional Chinese medicine. It has been used to treat disorders of the liver and upper respiratory tract (including bronchial asthma), reduce fevers, and to treat dyspepsia, chronic diarrhea, and scorpion stings and snake bites. But primarily, it is known as a liver herb that not only protects and heals the liver, but also prevents liver toxicity, neutralizes harmful biochemical changes in the liver caused by many toxic agents, and even improves the flow of bile. Let's look at some of these benefits in a little more detail. Cell death following ischemia-reperfusion injury is a major concern in clinical issues such as organ transplantation and trauma when blood supply to an organ is severely reduced. In a study to determine Picrorhiza's potential for preventing such damage, rats were fed an extract for seven days prior to the inducement of hepatic ischemia (i.e., the blood supply to their livers was stopped for a controlled period of time), demonstrated improved hepatocyte glycogen preservation and reduced cell death compared to control animals.8 Picrorhiza extracts have also shown to be effective in treating poisoning by the highly toxic death cap mushroom, Amanita phalloides.9 Picrorhiza provided significant restorations of all the biochemical changes poisoned/compromised by A phalloides except cytochrome P-450 and glycogen. Overeating. Too much enzyme-deficient food stresses the liver. Drug residues. Virtually all of the drugs that we take (medicinal and recreational) are processed, purified, and refined in the liver—in preparation for elimination from the body. Vitamin isolates. Many vitamins in their isolated form are toxic to the body and must be conjugated by the liver to render them harmless and make them available to the cells. Every time you supplement with such vitamins, you stress the liver. Cirrhosis aside, any consumption of alcohol causes inflammation of the liver’s tissue. Once the liver is inflamed, it can no longer filter, which causes it to plug up with fat and become even more inflamed. If we consume enough alcohol, we overwhelm the liver’s ability to regenerate itself, and the net result is cirrhosis (or hardening) of the liver. Thus, any herbs that are hepaprotective and that promote liver regeneration are an essential component of any health regimen. Like milk thistle, Picrorhiza has been shown to stimulate liver regeneration in rats.10 Specifically, studies have shown that oral administration of picroliv, a standardized fraction of roots and rhizomes of Picrorhiza kurrooa, showed stimulation of nucleic acid and protein synthesis in rat livers. Results are comparable to those seen when silymarin is administered. Even better. Picrorhiza extract was also shown to be effective in reversing alcohol-induced liver damage in rats. Treatment restored the damage in a dose-dependent manner (36-100%) over 45 days.11 This is significant for anyone suffering from cirrhosis. The bottom line is that the combination of milk thistle and Picrorhiza kurrooa extract has incredible liver protective and regenerative capabilities. In this case, the whole is greater than the sum of its parts. And again, most of us are not dealing with the extreme circumstances covered in the studies, but what those studies tell us is that milk thistle and Picrorhizza are mandatory for protecting our livers against the cumulative assaults of daily life. Black Walnut hulls have a long history in herbal medicine. Pliny the Elder, the Roman naturalist, talked about their healing power in the first century A.D. The seventeenth-century herbalist, Nicholas Culpeper, prescribed Walnut to draw poisonous venom from snakebites and spider bites. But it was the Native Americans who first used black walnut hulls as a laxative and as a vermifuge, a treatment for eliminating intestinal parasites. As a laxative, it expels parasites as part of its cleansing of the body and the high tannin and juglone content is thought to oxygenate the blood and kill the parasites. Black walnut is reported to be effective against pinworm, ringworm, tapeworm and other intestinal parasites. Juglone has been identified as a chemical that is antibacterial, antiviral, antiparasitic, and a fungicide. While there are very few scientific studies on black walnut hulls, the ones that exist are very interesting and suggestive. A 2012 study screened plant quinones for inhibiting effects on the bacterial fire blight pathogen. The most active compound discovered was juglone from walnuts.17 As the study said, "juglone has a potent and specific bactericidal effect on E. amylovora…Juglone is a promising candidate for the development of a new environmentally friendly plant protectant to replace the antibiotic streptomycin currently used in fire blight control." A 2002 study published in Phytotherapy Research found that juglone showed significant inhibition of RNase H activity in the HIV virus.18 This is a big deal. HIV-1 replicates itself through reverse transcription, a process that produces new double-stranded DNA from the viral genome's single-stranded RNA. During DNA synthesis, a DNA/RNA hybrid is formed as a replication intermediate and must be cleaved by RNase H before the process can continue. Inhibit that, and you inhibit replication of the HIV virus. And the study showed that juglone from black walnuts did just that. It is also important to understand that many parasites do not confine themselves to our intestinal tracts. There are at least 1000 species of parasitic organisms that can live in humans including Giardia, flatworms, tapeworms, hookworms, liver flukes, ringworms, nematodes, and a whole host of funguses. Incidendtally, medical labs only check for about 50-60 of them. Some encamp in the liver, and others, such as Cryptococcus gatti, invade the lungs, nervous system, soft tissue, lymph nodes, and joints. Anti-parasitic and anti-fungal herbs such as black walnut (not to mention heavy doses of garlic) can help drive all of them out of the body. Side effects associated with black walnut supplements are uncommon, and it is generally safe to use unless you are pregnant or allergic to nuts. Use while pregnant could "theoretically" cause birth defects or negatively impact the growth of the fetus or potentially cause a miscarriage. The odds of any of these things happening is extremely low, but it is recommended that you not use it while pregnant. One of the studies that we cited just a moment ago in support of liver's hepatoprotective benefits vis-à-vis chicory also verified that ginger works just as well in protecting the liver.27 As the study reported, extracts of ginger and chicory, given alone or mixed, significantly reversed the carbon tetrachloride-induced alterations in the biochemical and cellular constituents of blood. No toxic symptoms were reported in doses up to 5 g/kg. "The hepatoprotective effects of ginger and chicory were also confirmed by the examination of diseased liver tissue." And as we discussed when looking at the Liver Flush Tea, ginger also helps control temporary nausea,28 which makes it useful in morning sickness during pregnancy, and in fact, it was once used by sailors as an anti-seasickness tonic. More to the point, it is invaluable in liver cleansing programs since occasional nausea during a liver detox is always a slight possibility. Another study found that both Chinese Mahonia (Mahonia fortunei) and milk thistle reduced the incidence of liver lesions, including vacuole formation, neutrophil infiltration, and the death of liver cells caused by carbon tetrachloride.30 Moreover, Mahonia increased the activities of the anti-oxidative enzymes superoxide dismutase, glutathione peroxidase, and glutathione reductase and decreased malondialdehyde levels in the liver (a marker of free radical stress), as compared to those in the untreated carbon tetrachloride group. In the end, all species of Mahonia share the same key components so that studies are mostly transferable from one species to the next. Artichoke leaf is used by herbalists to detoxify and protect the liver, stimulate the flow of bile, and lower cholesterol. In that regard, it is actually backed by a number of studies. Note: gentian is a "medicinal" herb and should not be used for longer than three weeks at a time as it will eventually over-stimulate the body. A rest of two weeks is enough before it can be used again. As I mentioned at the top of the newsletter, although the Liver Flush Tea and the Liver Flush Tincture are companion formulas, and are both used as part of a liver detox protocol, they are not the same thing. They play fundamentally different roles in the body and are used in very different ways. Whereas the liver tea is primarily a cleansing and "easing" formula that can be used on an ongoing therapeutic basis, the liver flush tincture formula is more of a medicinal rebuilding and anti-parasitic formula designed to be used on an as needed basis. For most people, one bottle used as part of a semiannual liver detox is all that's required. For special situations, you can use up to three bottles back to back to back. But then take at least two weeks off before using again. It can also be used as part of an ongoing maintenance program in which you consume one bottle a month for as long as desired. Again, the liver tincture as described above is "medicinal" in nature and is one of the most powerful formulas I work with. As such, it requires breaks in use so as not to exhaust the body. For information on the liver detox protocol and how to detox go to our liver detox instructions page. I love Dr Barron's well-researched articles - very informative and educational and up to date. Very nice information thanks a lot.. I have an 11 year old boy on the spectrum who is having issues with a "fatty liver"- he has a yeast over growth we are trying to control- would kutkin be safe for his age? We have him on a sf-cf diet right now- taking a probiotic and enzyme with each meal. There are no known issues regarding kutkin and children, but you would definitely want to work with your son’s pediatrician in regard to giving him any herbs for treating medical conditions. What would be the protocol for someone with Primary Liver Cancer Stage III B, Cirrhosis & Hep C? I understand that cirrhotic livers can not regenerate or be repaired. Liver cancer is not curable according to my husband's oncologist. Though his liver function is still good, he was told that his chances of survival up to 3 years is less than 5%. The cancer would be monitored & managed by radiation and/or drugs but ultimately the liver would fail & metastasize to other areas. He is 67 yrs young & otherwise in excellent health. Thank you in advance for taking the time to respond. Is there any help or cure, or have you helped anyone to get rid of Blastocystis Hominis (a parasite). I have taken two series of medication from my doctor (metronidazole, Flagyl) but it did not help. I woud greatly appreciate your suggestion. Have you considered doing a full body detox which contains multiple anti parasite elements? Or even just taking something like Jon Barron’s antipathogenic formula. I am a 60 y/o female and I have been diagnosed with Hepatitis C. I and am about to start taking medication for this and was told that the only way that I can cure this is through medication. I don't believe that medication is the only way to cure Hep C and would like to know what my alternatives are. I have my physicals every year and only found out about this last year at the age of 59. I have never used drugs and I've been married for 32 years and my husband does not have it. I would do a search on our site for Hepatitis C and you can see the various articles on the topic. I need the same in India. How can I procure. Is there an alternate medicine for the tincture?